The Round 17 Match Day Partner is Powershop, make the switch. Visit powershop.com.au. This weekend is Member Appreciation Round. We’re celebrating, recognising and rewarding our 40,000+ Shinboners in 2018. Kids go FREE! Kids under 15 receive FREE general admission tickets to all of North’s Sunday games in 2018. Terms and conditions apply. Tickets are available for this match from just $25. You can purchase tickets online at ticketmaster.com.au or by calling 136 100. For up to date public transport information in Melbourne including timetables, service disruption information, ticketing or special event services visit ptv.vic.gov.au or download the PTV App. Night trains run hourly all night on Friday and Saturday from Flinders Street Station on all lines, except Stony Point and Flemington Racecourse lines. Many stations have more frequent train services through the night. City trams run to Etihad Stadium from La Trobe Street and Harbour Esplanade. Trams also stop in the CBD on Spencer Street, Bourke Street and Collins Street and all are a short walk to Etihad Stadium. It’s Member Appreciation Round and we have plenty in store to celebrate, reward and recognise our Shinboners in 2018. Make sure you get to the game early so you don’t miss out on the fun! Located on the internal concourse at Gate 5, uCube is a giant play area that will keep the kids entertained. There are ball pits, marking activities, slides, obstacles and much more! - See how high you can jump! Membership representatives will be located in the Membership Hub outside Gate 5 for membership sales, general enquiries and scarf or cap collection. There will be a photo booth, face painter, and a player appearance in the Hub pre-game. All Premiership Club and Schimma Platinum Club members will have access into the Premiership Room on Level D at Gate 6. Free Mini Golf will be available in room. Food and drink options are available for purchase in the room. Reservations are not required. All Barry Cable Social Club members will have access into the Social Club room on Level 1 at Aisle 15. Social Club members have access to guest passes. These are available for purchase from the club ($35 for an adult), price includes entry into the ground, access to Level 1 seating bays and access into the Social Club room. To purchase, call 1300 KANGAS (1300 526 427). There will also be player appearances in the room 30 minutes after gates open. Free Face Painting and Kids Activity Corner will be available in the room. North Melbourne members can bring a friend for FREE to one of our two remaining home matches at Etihad Stadium. Please note that Bring a Friend tickets are print-at-home tickets and must be printed. Tickets on mobile phones cannot be scanned at the gate. 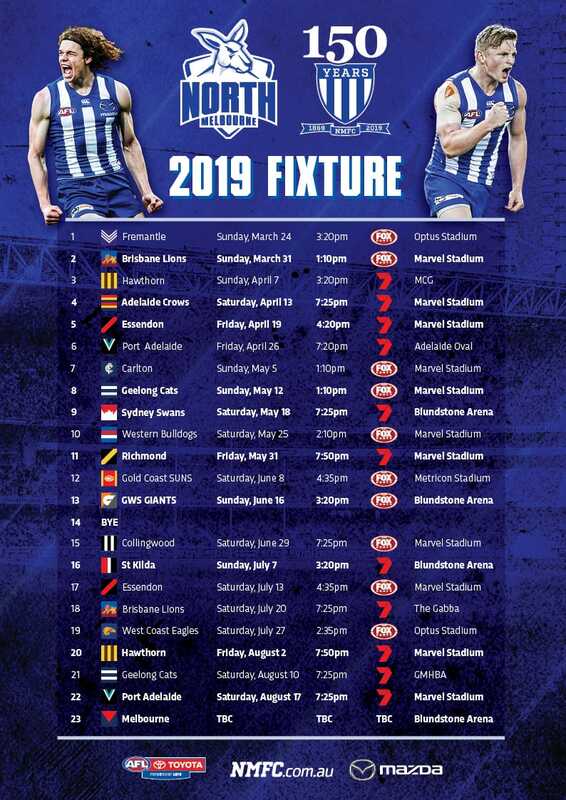 At North Melbourne we understand that sometimes even the most loyal and passionate members may not be able to make it to every home match in a season. That’s why we’ve introduced a member seat return program which gives you the chance to return your seat(s) to the club for individual matches throughout the season. If your membership seat(s) sell through the ticketing agency, you will receive credit towards your 2019 membership or refund on your 2018 membership. Adult and concession members will receive a credit at $25 per seat sold while juniors will receive $15. While barracking and supporting the club is a vital part of the match, offensive or aggressive behaviour (including yelling and swearing when dealing with club staff, agents or AFL or other event staff) will not be tolerated. Club members who breach the behaviour code of conduct may face penalties including cancellation of membership without refund. The club endorses the AFL's stance on vilification and has a zero-tolerance for members or supporters that abuse the opposition, other members and supporters, or umpires on grounds of race, religion, gender and sexuality. Up to 70% off for members! Social Club Sale: located in the Victory Room, Level 1 behind the Northern Goals, members can show their 2018 membership card at the door to shop the exclusive social Club sale. Up to 70% off items for Match Day only. Outside the ground: The Roo Shop will be set up outside Gate 5 at the North Melbourne Club Hub. Open from 1.30pm until quarter time. Inside the ground: Inside outlets at Gates 5 and 7 will be open from gates open until 30 mins after the game. Special offer for members: 20% of media polos when showing your 2018 membership card. Members receive a 10% discount on all other merchandise upon presentation of their membership card. 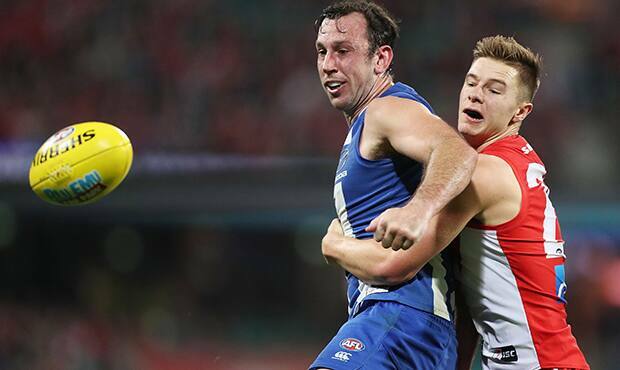 Join the conversation using #AFLNorthSwans and #BeAShinboner. Follow @NMFCOfficial on Facebook, Twitter and Instagram to stay up-to-date with the latest news and everything happening on match day or at Arden St. It's a massive game against the Swans this weekend, and the boys want you there to cheer them on!